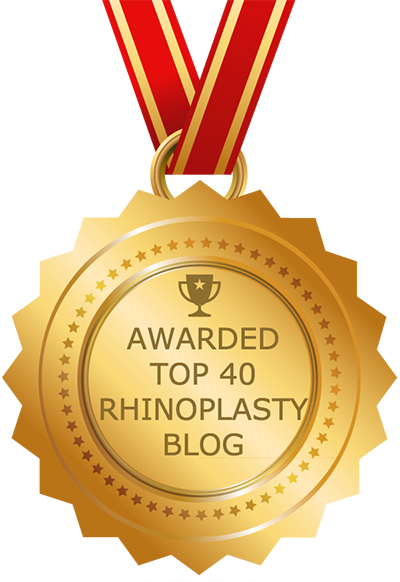 Rhinoplasty combined with septoplasty, otherwise known as septorhinoplasty, is facial plastic surgery designed to improve both the form and function of the nose. This amazing procedure straightens the septum (the bone and cartilage that separates the nostrils) and alters the cartilage, bones and skin that give the nose its structure and shape. Though they are sometimes combined into one procedure, rhinoplasty and septoplasty are actually two separate procedures. Rhinoplasty addresses both external and internal tissues of the nose for functional and/or aesthetic reasons, whereas septoplasty deals exclusively with internal tissues/structures and is performed solely for functional reasons – namely to restore proper breathing and airflow. Combining rhinoplasty with septoplasty allows the surgeon to provide patients with a nose that is both functional and attractive, symmetrical and in proportion with other facial features. In most, but not all, cases, the functional aspect of septorhinoplasty (restoring proper function and airflow to the nose) is the primary focus of the procedure. There is no reason you can’t have a nose that both functions well and looks good. If you have a functional problem with your nose (e.g. nasal obstruction and/or breathing) but are also unhappy with its appearance, septorhinoplasty may be the solution. This procedure includes rhinoplasty, which is the only way to change the cartilaginous part of the nose. There are many potential benefits associated with having septorhinoplasty. Among the most important are the fact that the procedure is more economical than undergoing rhinoplasty and septoplasty separately, and that it allows patients to undergo anesthesia and recovery just once. Septorhinoplasty is comprised of two procedures: septoplasty and rhinoplasty. The rhinoplasty portion of the surgery deals with the exterior of the nose; it may involve alterations to the nostrils, tip, bridge and other structures. During this stage of the septorhinoplasty procedure, the surgeon makes an incision in the nose’s inner lining (the mucosa), and lifts it off the bone and cartilage. The surgeon also removes portions of the bone and cartilage that are distorted and makes sure that the remaining tissue/bone is straight. Additionally, the surgeon can remove some of the cartilage to refine the nasal tip. If you have a hump, the surgeon will shave it down. The surgeon can also narrow and straighten the nasal bones through a process called infracture, which involves breaking and then resetting the bones. The nose also may need to be rebuilt to some degree. During the septoplasty portion of the procedure, the surgeon alters the septum in order to straighten it and to improve airflow; in many cases this involves the use of grafts harvested from the septum itself or another area such as the ear. Septorhinoplasty is typically performed on an outpatient basis under general anesthesia. The procedure usually takes one or two hours. In some cases, patients need a cast on the nasal bridge as well as splints on the septum. Both are removed around a week after surgery. Most patients are able to return to work about a week after surgery. Any bruising around the eyes typically subsides within two weeks of the procedure. In most cases swelling increases for a few days following surgery before gradually subsiding. Swelling usually subsides noticeably after about one month; however, the nose will continue to heal for around a year following surgery. Regular office visits are necessary during this time. It is very important that you select the right surgeon to perform your septorhinoplasty procedure. Otolaryngologists (ear nose and throat specialists, or ENTs) can perform septoplasty, but not all of them are qualified to perform rhinoplasty on the external features of the nose. Only a board-certified facial plastic surgeon is truly qualified to perform this portion of the surgery. The best septorhinoplasty surgeons are facial cosmetic surgeons with double board certification in facial plastic surgery and otolaryngology.